Yesterday, discount department store chain T.J. Maxx and its sister chain Marshalls made headlines with their offer of 16 GB Wi-Fi iPads for $399.99, a $100 discount from Apple's regular prices. 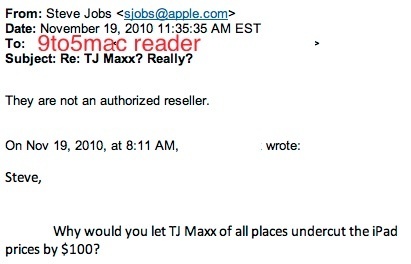 9 to 5 Mac now reports on a purported email response from Apple CEO Steve Jobs noting that T.J. Maxx is not, in fact, an authorized Apple reseller. Q: Why would you let TJ Maxx of all places undercut the iPad prices by $100? A: They are not an authorized reseller. The unsurprising revelation explains the lack of official Apple promotional materials accompanying the sales, but questions remain regarding from where T.J. Maxx and Marshalls are obtaining their stock of the devices. Apple is almost certainly investigating the circumstances behind these sales and may seek to address the issue of their discounted pricing, which is carefully controlled by Apple throughout its network of authorized resellers.